"Fragrant, warming and delicious curry-tinged soup, lovely over rice. Adjust curry paste to increase or decrease heat. Curry paste is available in jars in Asian stores and the international aisle of many grocery stores." Heat peanut oil in a large sauce pan over medium heat. Stir in chopped onion, and cook until softened and translucent, 3 to 5 minutes. Add red bell pepper and continue to cook for 3 to 5 more minutes, until softened. Stir in the curry paste and cook for 1 minute. Pour in the coconut milk and slowly bring to a simmer. 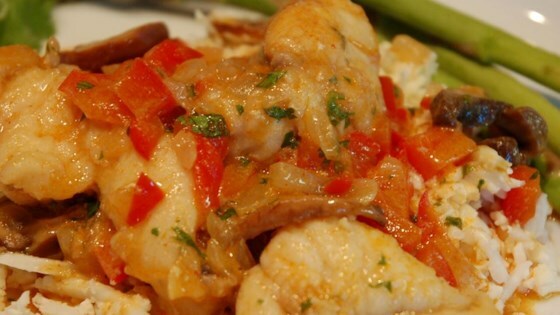 Once coconut milk begins to simmer, stir in cubed monkfish, and simmer 7 to 10 minutes, or until the fish is firm and the center is no longer opaque. Stir in fish sauce, lime juice, and cilantro before serving. So I thought this was great but my guests were blown away by it. They kept asking me if I really made this.... Not sure how I feel about that but it gives this recipe 5 stars. It was lacking extra zing. I think it could have used some freshly squeezed lemon juice to add some tang.